Ultrasound examination (sonography) is often used in the diagnosis of pathological changes of the thyroid gland, including cancer. The accuracy of this method in identifying malignant tumors is 95%, indicating the reliability and informativeness. This method of diagnosis is a relatively simple, widely available, painless, and harmless (no radiation load on the patient). Does not require special training to study the use of contrast media. However, when detected in the thyroid gland nodal formations is not always possible to ascertain their nature (i.e., benign is a tumor or cancer). Examination of the thyroid gland is carried out according to standard methods: ultrasound mode gray scale, color and power Doppler mapping. To improve the diagnostic standard is complemented by research mode of tissue harmonics, colorizing, three-dimensional image reconstruction of the body. 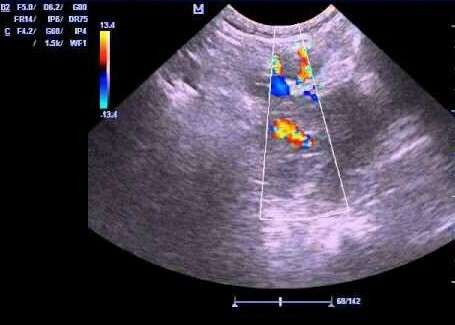 To verify the nature of the tumor perform fine-needle biopsy under ultrasound control. For this portion of gland, suspicious for tumor characteristics, is injected with a fine needle, which produces a collection of cells for subsequent histological examination. The advantages of this method of diagnosis is the accuracy and low invasiveness. Ultrasound scanning can reveal the pathological lesions of the size of about 3 mm, which allows to diagnose thyroid cancer at an early stage of development. When aspiration biopsy it is possible to detect malignant lesions even at the preclinical stage. Hypervascularization education with the presence of pathological network of blood vessels. The increase in regional lymph nodes. It is important to remember that when you have three or more of these symptoms on ultrasound – high probability of cancer, however it is not 100%. In benign processes in the thyroid gland can meet these symptoms (one or a combination of both). Hypoechoic rim for cancer of the thyroid gland has an intermittent course, different thickness, which distinguishes it from the rim, which happens to be in adenoma of the gland. For malignant lesions the characteristic calcification of small size, indistinctly marked or missing track low echogenicity from them, detected with ultrasound. The microcalcifications are seen in cancer as a whole, in contrast to those with adenoma. Most common papillary form. Its characteristic feature is the pathological formation hypoechoic with microcalcifications, frequently revealed a cystic component in the pathological focus, with hypervascularization partitions. The study found feeding the tumor vessels located in the surrounding tissue. Medullary form similar to the first (nodes of low echogenicity + calcification), but often when an ultrasound revealed multinodular education or more tumors in the parenchyma of the gland. Follicular cancer is different from the previous first fact that occurs in older patients and develops in most cases of thyroid adenoma. At the same time on the ultrasound screen marked swelling a rounded shape, increased echogenicity, homogeneous structure and with a strong hypervascularization. On the periphery of the detected discontinuous hypoechoic rim. Often grows the capsule, extends to adjacent organs (trachea, surrounding tissue, adjacent blood vessels). The most aggressive form is anaplastic, in which the tumors displayed areas of necrosis due to decay, often marked by the invasion of the pathological process beyond the organ (germinating capsule of the thyroid gland, spreading in the surrounding tissue, metastatic regional lymph nodes). In conclusion, it should be noted that sonography is an informative method of diagnosis of thyroid cancer, allowing to identify pathological changes in the body, even at an early stage, in most cases, to differentiate benign from malignant, and to assume the morphological form of cancer. He also used to measure the spread of the pathological process beyond the organ and to detect metastases in regional lymph nodes. Don’t forget that in order to improve the diagnostic accuracy of this method, the standard research in the gray scale should be supplemented with other modes, to assess the blood flow in the body, to perform three-dimensional reconstruction of the thyroid gland. Symptoms of thyroid cancer and how you live after the surgery?